I’ve been given a lot of children’s health books since my babies were born. Some were good. Some, not so useful. 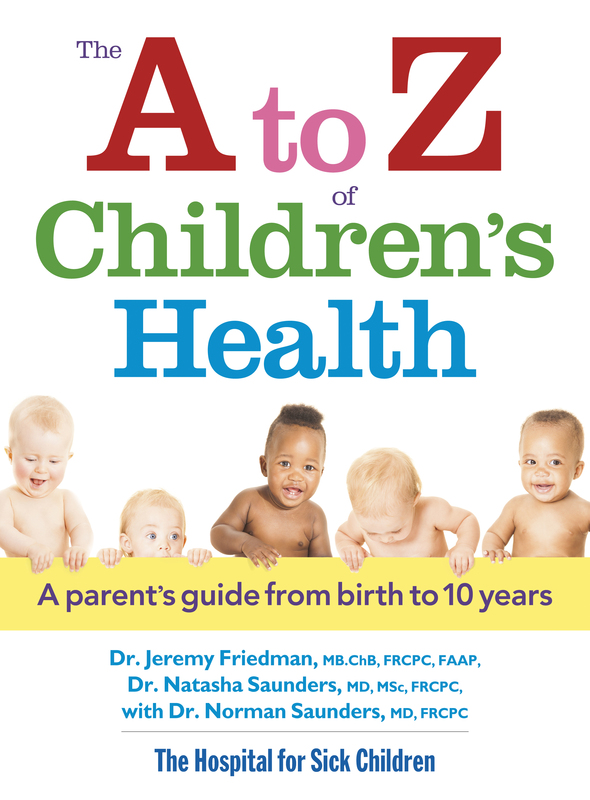 Recently, I received the A to Z of Children’s Health written by Dr. Jeremy Friedman, Dr. Natasha Saunders and Dr. Norman Saunders. I’ve gotta say, great book. First impression: great photos, easy to find what ails my children (and therefore makes me suffer), simple language but great detail about the medical issues, signs and symptoms and treatments. All those other books I have received have been on my bookshelf for the last six years (basically, the lifetime of my daughter and oldest child). They were informative…if I had time to sift through them looking for answers. But this book has a great index, wonderful photos of the issues I might encounter with my kids, and tips that, when there isn’t an emergency staring me in the face (read: no one is bleeding on my white carpet), I can use to determine if the issue is serious or not. Before I became a parent, I didn’t really consider that there would be grey areas for emergency issues. I kind of figured that if my child was climbing a tree and fell out of it, breaking their limb, it would be glaringly obvious. Apparently, not so. A child could break a limb and appear only slightly uncomfortable from the pain caused by the crack. If left untreated, the crack may not heal properly causing further problems down the road. And what do you do if the injury or pain is not visible? What if it’s a headache? Until I read this book, I didn’t even really consider that children suffer from headaches. I thought that was just an adult issue brought on by stress at work combined with misbehaving children. So, in short, The A to Z of Children’s Health has been a wonderful addition to my desk where I keep all books to which I need to refer on a daily basis. This one will not be going on the shelf. It needs to stay close at hand. And, if you have children and you get a chance, I suggest you pick up a copy for yourself. You’ll be glad you did. And of course, for me, being a survivor of a childhood illness that saw me enjoy a lengthy stay at The Hospital for Sick Children in Toronto, and the fact that the authors of the book are pediatric experts at this world-renowned hospital for sick children, was another comforting fact when referring to their writings on how to handle different illnesses and injuries. The book includes real cases/examples, full colour photos and detailed illustrations. And this is what I loved most about it. It’s difficult to describe a child’s rash to Dr. Google and get a response that doesn’t send a mother over the edge worrying about the potential terrible diseases their child may or may not have contracted. With this book, you can find the topic your mother’s instinct is telling you it might be in the index and then see pictures of similar cases to determine if that’s really what your child has. Another great thing I liked about this book is it covers birth to 10 years. Most children’s health books cover only the first year of your child’s life; if you’re lucky, maybe two years. So, if you’ve got a dare-devil child like my two, or a child who is prone to illness, you’ll not want to be without this handy resource. Disclosure: I received a complimentary copy of The A to Z of Children’s Health for this review. I was not compensated in any other way. The opinions expressed above are, as always, my own. This entry was posted in Uncategorized and tagged childhood injuries, children's health, Family, health and safety, injuries, kids, Kids, medical issues, Natasha Saunders, Norman Saunders, Parenting, Reviews & plugs on October 22, 2013 by Nancy.